After my first full week of using the Samsung Epic 4G, I am very impressed. Although there are a few things that I miss from my Palm Pre, the benefits are incredible. 😀 Better call reception and signal strength. It’s is a phone after all. The Epic seems to hold on to a signal better than the Pre. Even the people on the other end of the call have noticed the difference in clarity. 😀 Faster processing for all tasks and apps, plus more storage space. Everything runs so smoothly on the Epic. It’s very polished and definitely not a first-generation product like the Pre. Plus, it comes with a 16gb microSD card! 😀 Faster email downloads. The Epic seems to grab chunks of emails at a time unlike the Pre which crawled through its two-stage download. 😀 Faster web browsing. Web pages load so quickly that you really have a choice between full sites and mobile site. 😀 No Bluetooth problems. Easy syncs with my car, stereo headphones, laptop and desktop (w/ dongle). 😀 No GPS problems. Maybe I should just say… so far. It’s still an improvement over the Palm Pre’s GPS. 😀 Impressive Camera. The 5-megapixel camera has many features found in new point-n-shoots. But, the “point on LCD and focus” feature I would love to see I my Canon 7D! 😀 Android 2.2 with Flash very soon. Although the Epic is currently shipping with Android 2.1, Samsung has finished the modifications to Android 2.2 for all Galaxy Class phones and has released it to the carriers. And, because it is Android, there are plenty of Apps for productivity, finance, news, lifestyle, travel, reference, tools, shopping, social, entertainment and of course games! It is very easy to customize the Epic’s Home screen. 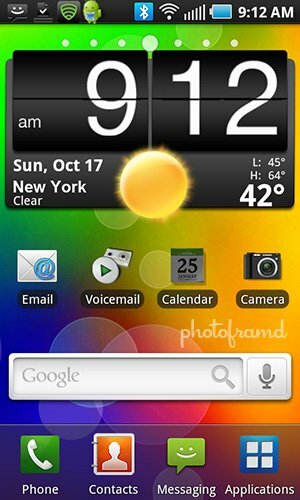 The above screen capture is my current Home screen which combines widgets and live wallpaper to recreate the HTC Sense feel. Everything is available through the Android Marketplace built into the Epic 4G. NOTE: Sprint just announce that 4G coverage will be officially available in NYC on 11/1/2010 and in LA on 12/1/2010. Gmail is a must for Android. Just accept it. I have never used a Gmail account except for test purposes. But, with Android phones, there is no getting around it. Of course, you can use a “real” email account for all email correspondence but you will want a Gmail account just to sync with Google Contacts and Calender. In fact, moving from a phone like the Palm Pre which can sync with Gmail will make the process so much easier. Gmail is the EASY way to move your contacts, calendar and tasks from one phone to another. Even is you do not already have a Gmail account, just create one for the data transfer. All you have to do is sync your old phone with the Gmail account, check that the data is all there and then sync your new phone. Your contacts, calendar and task will be transferred automatically to your new phone. Keep in mind that this sync on Android phones needs to be conducted through a WIFI connection and will probably NOT work through your phone’s data connection. The Pre was more flexible its method of syncs. If your data from your old phone is not syncing with your Gmail account, you will need to check how the information is being stored on the old phone. With the Pre, you will need to change any contact or event from the local default to your Google account by going into each entry. Then, sync again and all your data should be transferred to your Gmail account. PreCentral has a great way to export your contacts from your Pre to either a CSV (which will not work on AT&T phones) or by email. Sprint will transfer your contacts for you to your new Sprint phone, so will other providers. However, you will need to transfer your calendar, tasks and anything else (like music, videos and photos) yourself. Keep that in mind before you give away your old phone! You will definitely want a least one extra battery for the Samsung Epic 4G. I have been averaging about 9-hours with active email/web/Facebook/TXT plus gameplay, as well as phone calls. (It’s the internet time that really drains the battery.) This is still better than my old Palm Pre with an extended battery. Unfortunately, the Epic is too new and there are no extended batteries available for it. In fact, the OEM Epic battery is the SAME battery as the Samsung Captivate i897, Vibrant T959 and Fascinate – EB575152VA. You can find these OEM Samsung batteries on Amazon for around $20. But, keep your eyes open for ET-CHGPKNVGSTA which includes the Samsung OEM Battery Charger with Stand, Samsung 1500mA Standard Battery and Samsung Wall Charger. 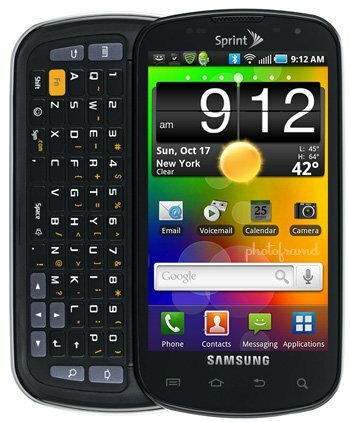 Your local Sprint store should have this in stock for under $50 and your sure to get real Samsung parts. 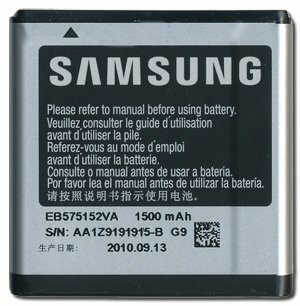 I have read several posts on different Forums that indicate these Samsung batteries really need to be charged from an electrical outlet (instead of the USB connected to a computer) to achieve a full charge. With that said, getting an extra wall charger and separate battery charger will allow you to charge both the Epic and an additional battery at the same time. But, this widget is more than just a pretty face. Click on the weather icon to see the 5-day forecast from Accuweather.com (or Google, your choice). From there, you can click to jump directly to Accuweather.com for additional info like highly accurate hour-by-hour forecast. The specified location can be set by you or vary by GPS, but it warns that the GPS setting could drain the battery. The background is called Sense Live Wallpaper by Live Wallpaper. It is fully animated and flows beautifully. I love the combination of these two! Another Home Widget is a actually a collection called Jorte. 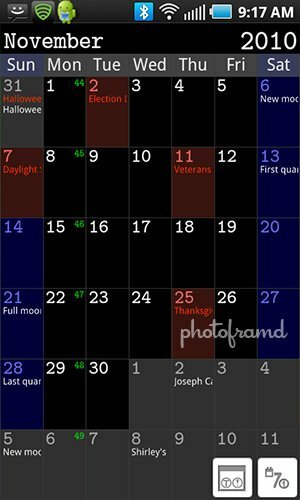 It includes the best calendar at-a-glance that I have been able to find on Android. 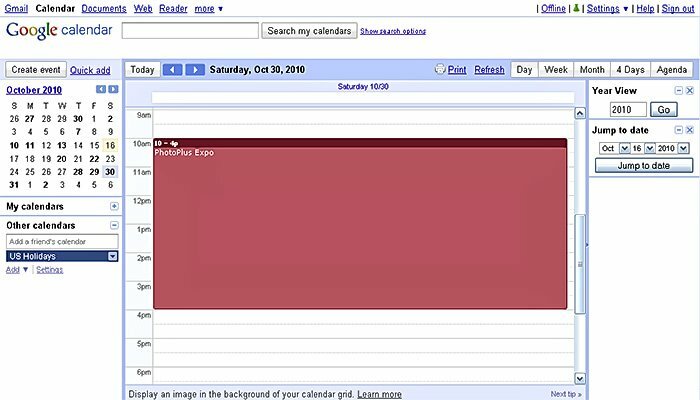 Jorte actually contains several different widgets for Calendars, Agendas and Tasks to fit your Home space and needs. These widgets will click to the full Jorte Calendar App which can be set to automatically sync with your Google account instead of Android’s local default “My Calendar”. Lookout has received a lot of publicity recently. It was featured in a recent Verizon Droid commercial. But, it is available for any Android phone and it’s free (at least for now). 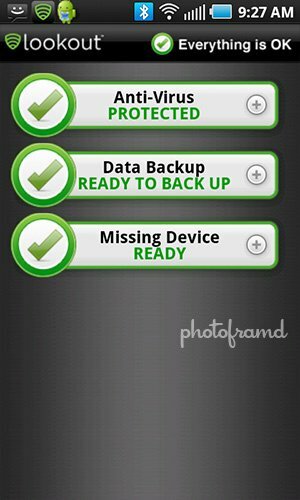 It includes three parts – an antivirus app which runs continuously in the background, a data back-up utility and a missing device locator. The locator will use your phones GPS to find it and can send out a “screaming” siren to alert everyone to its existence. 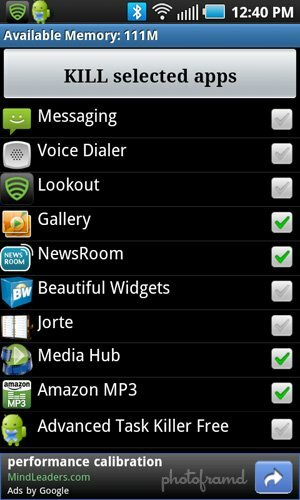 If you are on Sprint, look for Lookout in the Sprint Apps tab in the Android Marketplace. The easiest way to extend your battery life is to eliminate any unnecessary App running in the background. Advanced Task Killer makes it easy. Just check off the ones you don’t need and click the Kill selected apps button. Simple. NOTE: Android 2.2 is supposed to have both better background App management and better battery management, so you may not need this App once the 2.2 update is released. Until then, you can use the free version of this App. Next Up – they best Android Games and Apps for the Samsung Epic 4G.